After all the pongal and festival food that we had for the last of couple of days, I thought I'll post a simple dish today, Broken Wheat And Vermicelli Upma. In the past, I have made upmas using only vermicelli or only broken wheat or semolina, this is the first time that I have made it using both vermicelli and broken wheat. I have made it as a vegetable upma, using potatoes, bajji milagai ( light green peppers that are big in size ) and some dill leaves for flavor. The upma came out very well and I used the pressure pan for making ii. Serve it with some raitha or chutney for a healthy and filling dinner..
Heat some oil in a pressure pan, add the peanuts and roast for a minute or two, then add the chana dal, urad dal and mustard seeds. When it starts spluttering add the chopped onion and garlic and saute for a minute. Now add the potato, bajji milagai, dill leaves and saute for another minute, then add the chopped tomato, turmeric and chilly powders and saute for a minute. Then add the vermicelli and broken wheat and mix everything together for another minute. Now add about 4 cups of water and salt and close the lid and put on the whistle. After one whistle, reduce the heat completely and cook for 6 to 7 minutes and switch off. When the pressure is released completely, open the lid, mix and serve. The bajji milagai that I get here in Bangalore are not at all spicy, so I have used two of it and some chilly powder, if it's very spicy, then reduce the number to one and also don't add the chilly powder. Roast the vermicelli first, if you are using the plain vermicelli and not the roasted variety. You can include other vegetables of your choice. Also you can replace dill leaves with mint leaves. You can do the entire cooking in a regular pan, but the pressure pan makes the job much easier. Sending it to Dish-It-Out - Light Dinners event started by Vardhini of Cooks Joy and hosted by A Bowl Of Curry. Also sending it to the New "U" 2014 event held by Vardhini of Cooks Joy. 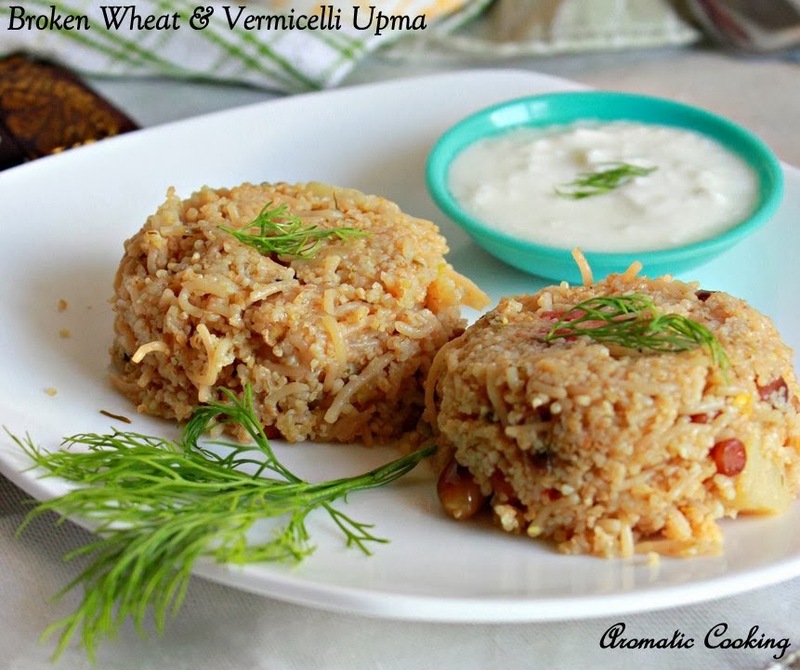 love this kind of one pot easy meal, liked the addition of banana pepper & dill leaves, sure a flavorful and delicious upma...thanks for sharing! 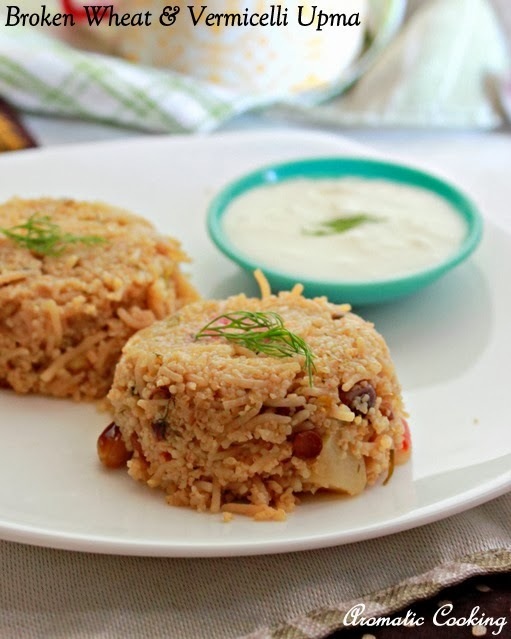 very nice and tasty upma. Wonderful combination.. lovely presentation too!! Vermicelli and wheat....an interesting combination. They look very tasty. 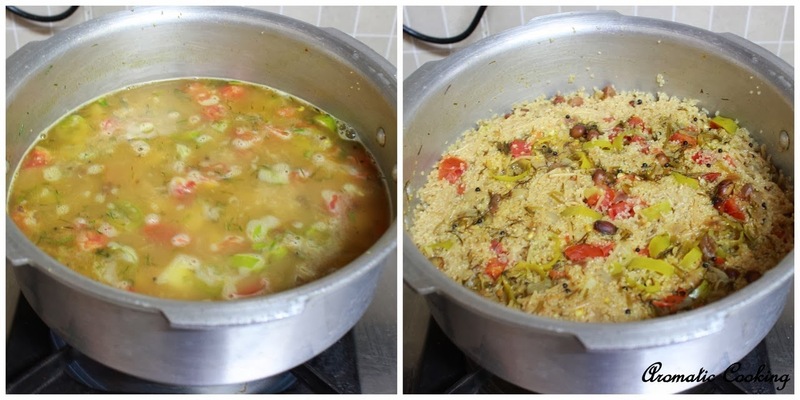 A novel way of preparing Upma! Liked the idea. Looks delicious too. Nice combo.Never tried this way.Looks so nice. hhmm thats an interesting combo.....and adding bhajji milagai.. super Thanks so much for linking to my event.Looking for more..